The endless dispute over payment of rentals for palatial houses of Punjab and Haryana ministers has taken a new turn. The Chandigarh Administration last fortnight shot off an ultimatum asking Punjab to pay Rs 60 lakh and Haryana Rs 50 lakh as arrears of rent of houses for their ministers in Sector 2 and 3 here. 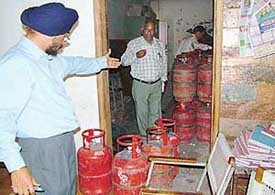 Officials of the Department of Food and Supplies raided a showroom owned by PPCC member, Mr Balbir Singh Sidhu, in Industrial Area, Phase I, here today and seized 29 empty LPG cylinders stored “illegally”. 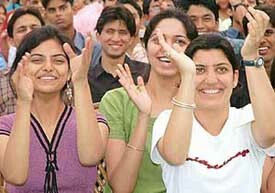 After Pune, Chandigarh is all set to emerge as a major centre of the cooperative management studies. Come July, the Regional Institute of Cooperative Management (RICM), Sector 32, will start a new course — postgraduate diploma course in business management. Four youths, riding two motor cycles, robbed a city resident at the gunpoint in Sector 38, opposite the Dainik Bhaskar office, late last night. They were also carrying a sword. Monthly/daily minimum wages for daily-wage earners in various departments of the Chandigarh Administration for 2005-06 have been hiked. 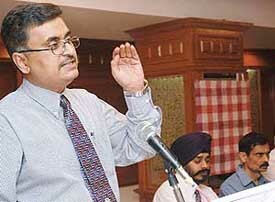 Deputy Commissioner Arun Kumar has allowed an increase of 7-8 per cent on the prevailing minimum wages from April 1. Hardeep Singh (70), a resident of Phase X in Mohali was killed early this morning when a speeding Toyota Corolla car hit his scooter from behind near the Sectors 45-46 light point. He died on the spot. The car was being driven by Shiv Kumar Behal, a resident of Sector 15 and General Manager and Liaison Administrator of Ranbaxy Pharmaceuticals, Mohali. The raising of an army corps in the north-western sector opposite Pakistan finally got off ground with the Army appointing a corps commander to take over the reigns of the new formation. Fifteen Probationary Nurses joined the ranks of the Military Nursing Service (MNS) as lieutenants at a commissioning ceremony held at the Western Command Hospital, Chandimandir, near here, today. Dr G.S. Somawat, Regional Director, National Commission for Scheduled Tribes, said today that the commission had directed various departments of the Central Government in the city to rework the backlog of vacancies under the Scheduled Tribe (ST) category for direct recruitment and the promotional posts. Most of the local residents contacted for reaction over USA refusing diplomatic visa to Mr Narendra Modi, Gujarat Chief Minister, have called it unfortunate. There are, however, mild murmurs justifying the US action. As many as 800 delegates from various parts of India and 50 delegates from abroad will take part in the national congress of the CPI scheduled to be held here from March 29 to April 5. The Chandigarh branch of Northen India Regional Council (NIPC) of The Institute of Chartered Accountants of India organised a seminar on Value Added Tax (VAT) in Punjab, Haryana and Chandigarh in Sector 35, here today. Pasteurised milk is 90 per cent bacteria free, is healthier and unlike raw milk does not carry the risk of causing tuberculosis, typhoid, dysentery and other diseases. Yet more than half of the total consumption of milk in the city is of raw milk, coming straight from dairies against the packaged pasteurised milk. While the UT Health Department is working towards making Chandigarh, “100 per cent pasteurised milk consuming city”, the small dairy owners cry that they would be the worst hit financially. There is a lot of talk about encroachments and violation of building bylaws in Chandigarh. Are building bylaws not applicable to government houses/quarters and government office buildings or only applicable to private houses? The Dalit Chetna Manch, Punjab, has demanded that the proposed fee hike in case of government industrial training institutes should be cancelled. In a press note issued here, Mr Shamsher Purkhalwi, president of the manch, said a deputation had met the minister concerned in this regard. The minister said he would ask the government to review the proposal. Chandigarh, March 19 The local unit of the BJP has decided to stage a dharna in the Sector 17 Plaza on March 24 in protest against the non-implementation of a judgement of the Punjab and Haryana High Court by the Chandigarh Administration regarding the regulation of fee structure in private schools. The Joint Action Committee of villagers living outside the lal dora will held a protest march tomorrow. Beginning from Hallo Majra village, the march would end at the residence of the Member of Parliament, Mr Pawan Kumar Bansal. 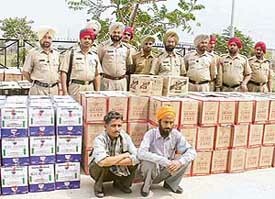 In a major catch the police seized 525 boxes of liquor being illegally smuggled into Punjab at a naka laid near Sohana in the wee hours today. Two persons were arrested in this regard. On getting a tip-off the police laid a naka near the bus stand at Sohana village under the supervision of SI Bhupinder Singh. The local police has recovered three Maruti Zen cars and as many Toyota Qualis vehicles following the interrogation of four car thieves brought here on production warrants. Three scooters were stolen in the city while four youths riding on two motor cycles snatched a bag in Sector 25, the local police said here today. Mr Sat Pal of Sector 20 reported to the police that his Bajaj Chetak scooter (CH-O1-R-7108) was stolen from Sector 22 market yesterday. A theft case has been registered. Cyanide-2005, the annual fest of Chemical Engineering and Technology Department of Panjab University, caught up with its festive colours this evening. While the morning programmes registered a thin attendance, the evening saw maximum participation by enthusiasts. Eight students have been awarded the Sri Paramahansa Yogananda Scholarships for the year 2003-2004 in the 5th SERC (Science & Engineering Research Council) School at Physics Department in Panjab University today. As many as 336 degrees were awarded to students of Government College, Sector 11, at the annual convocation and prize distribution function held on the college premises, here today. An “Entrepreneurial Awareness Programme” for students of Government Polytechnic for Women, Sector 10, was organised by the Regional Centre for Entrepreneurship Development (RCED) on behalf of UT Department of Industries, here yesterday. In support of their demands, students of Shri Dhanwantry Ayurvedic College, Sector 46, under the aegis of ABVP, burned the effigy of Panjab University administration in front of the Vice-Chancellor’s office today. A meeting of faculty members was called at Government College for Art, Sector 10, today. All staff members were present at the meeting. Mr Vivek Attray, Joint Secretary, Technical Institution and Head of the Department, talked to students who promised to attend the classes regularly. 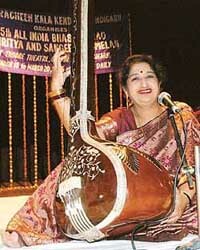 ‘As the artists grow old their ‘art’ blooms with more vigour and vitality as the life-long expertise and experience put together give an impetus for redeeming their talent appropriately.’ This veritably applied to vocalist Kankana Banerjee and Sunayana Hazarilal, a kathak danseuse, as both negating the age factor lit up the second day of Pracheen Kala Kendra’s ongoing Bhaskar Rao Sangget Sammelan with dexterous performances. THE Haryna Urdu Akademi organised a seminar ‘ Sahir Ludhianvi ki Shakshiyat aur funn’ and an all-India mushaira today at the Art Gallery today. The well acclaimed litterateurs and poets participated and presented their papers on the contribution of Sahir Ludhinavi to Urdu literature. Vanity Fair, a two-day lifestyle exhibition got off to a colourful start at the Whispering Willows on the Zirakpur-Patiala road today. According to Ms Priya, organiser of the exhibition, about 70 entrepreneurs were taking part in the exhibition. As many as 520 persons were examined by a team of doctors at a medical camp organised at Guru Nanak Colony, Phase X, here today. Various type of specialists examined patients at the camp which was inaugurated by the Kharar MLA, Mr Bir Devinder Singh. A brilliant performance by Tabish Hayat helped AG Punjab beat AG Andhra Pradesh by 2-0 on the second day of the All-India Audit and Account Inter Zonal Hockey Tournament being played at Hockey Stadium, Sports Complex, here today. The veterans IAS officers scored a convincing victory over their junior counterparts in a friendly cricket match played at PCA Stadium, here today. The veterans won the match by six wickets. The match was organised by the Punjab IAS Officers Association. Mr Y.S. 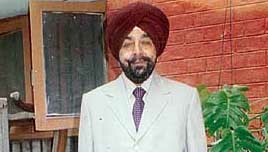 Ratra, former Chief Secretary of Punjab, gave away prizes while Mr P.H. Vaishnav, another former Chief Secretary, was the guest of honour. The First Chandigarh State Open Games 2004-05, under the aegis of Sports Department, Chandigarh, is going to be organised from March 22 to 24. It is also the celebration of “Year of Physical Education and Sports” under the charter of UNO/UNESCO. Taking a serious view of a news item — “Peeping Toms create panic in Sector 7 colony — published in Chandigarh Tribune, the UT police has decided to intensify night patrolling in Sector 7 and its vicinity.